I’m back from Nottingham!! I arrived back earlier today, so sorry for the lack of posts, but I do have three OOTD’s to post this week as well as a beauty one. Hopefully I can get some sleep tonight and sort out all of those posts for the upcoming week! I haven’t done one of these posts in ages!! Actually it’s 4 months.. oops? If you want to see my first post in this series you can see it here. If you don’t know what this post is, it’s basically to show you guys some of my favourite bloggers and hopefully introduce you to some new ones too! 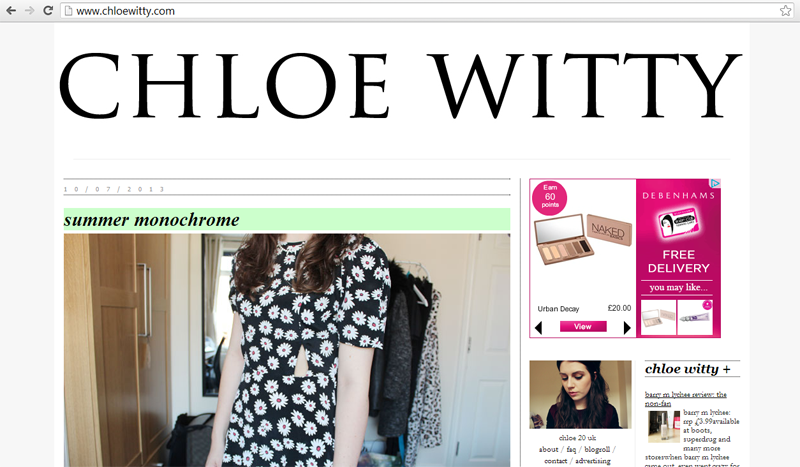 First up, Chloe from CHLOE WITTY. I would firstly like to say how much I laaaarve Chloe’s layout. It’s such a simple design but so smart.. I don’t know, I’m just one of those people that want’s things to look nice – some would say a perfectionist! I think a good blog layout will mean I’m far more likely to stay and look at the blog content. But then comes her posts and they just make everything even better. She mainly does OOTD posts with the occasional beauty/reviews. I love her style and tend to follow people who I can look at and imagine wearing the similar style, and I definitely can with Chloe. She has a great writing style and just overall great blog, oh and I’ve also recently subscribed to her new youtube which you can find the link to on her blog! Next up, Lydia from LYDIA FAYE JONES. This girl is so gorgeous it makes me want to walk around with a paper bag over my head for the rest of my life. The other thing that comes to mind when I think of Lydia’s blog is bright colours – in nearly every outfit she’ll have a bright/neon peice and she always looks good in it. So not fair. 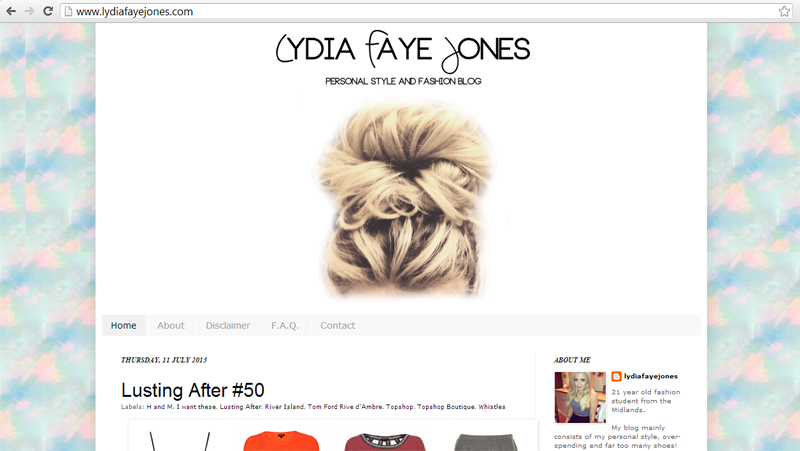 Lydia’s blog mainly consists of OOTD’s with occasional wishlists and hauls etc. Lydia writes a bit about her outfits and the cothing she features which is also nice too. Finally, Tilly-Jayne from TILLY-JAYNE. 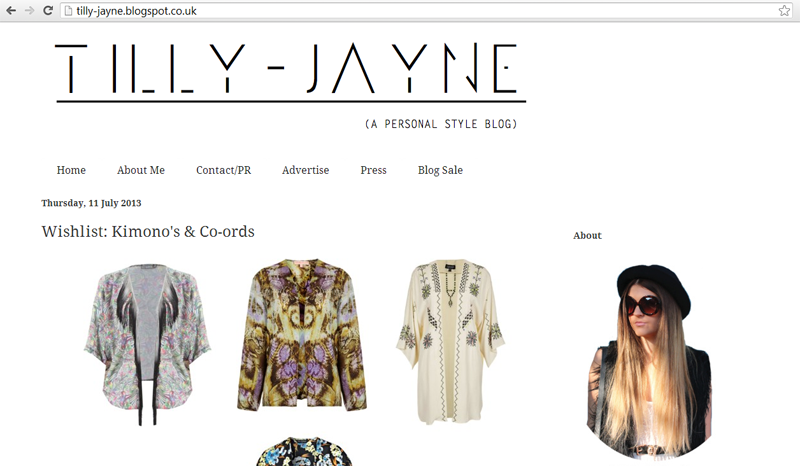 I really love Tilly-Jayne’s style, it’s quite girly and I can almost always see myself wearing the exact same. She knows exactly what goes well with what, and even if she didn’t, I’m pretty sure she’d make it work whatever. I love the way she writes, she seems to write about the clothing aswell as giving a quick review on them sometimes too which is always helpful! I love her hair – it’s so pretty and her blog is one you all need to check out!